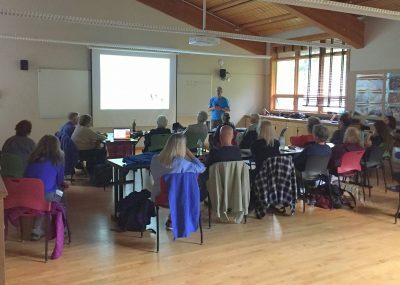 From June 29 through June 31, 2018, the North Cascades Institute hosted Prof. John Marzluff, from the University of Washington to share his knowledge and work on Corvids, arguably the smartest of the bird families. 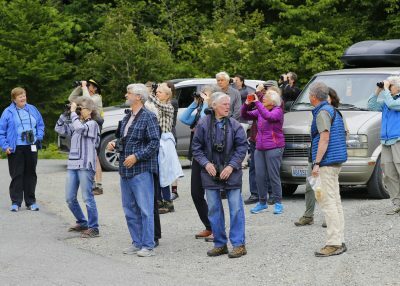 Marzluff, who has been teaching for the Institute for almost ten years, continually fills courses to the brim, and this year, his “In the Company of Corvids” adult weekend seminar was expanded to twenty eager participants, all excited to spend time in the field searching for ravens, crows, jays, magpies, and nutcrackers. The weekend began on Friday, after lunch at the Environmental Learning Center, with introductions and afternoon lectures by Marzluff, and Kaeli Swift, on their work studying crow behavior and information sharing. The afternoon lectures provided a basis for the weekend’s main focus, field observation and study of corvids in the wild. 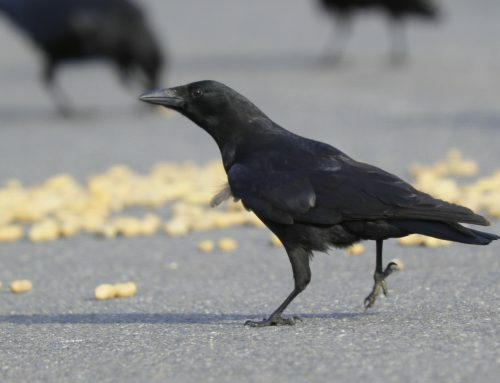 Both Marzluff, and Swift, (a graduate student of Marzluff’s also studying crow behavior), shared anecdotes about fascinating corvid behavior, and highlighted the particularities of the family known to recognize human faces and outwit traps and mazes in order to find food. 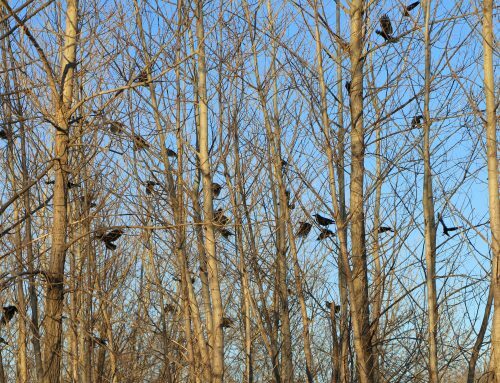 We also heard a fascinating talk by Dana and Bob Fox about a winter crow roost north of Boston. 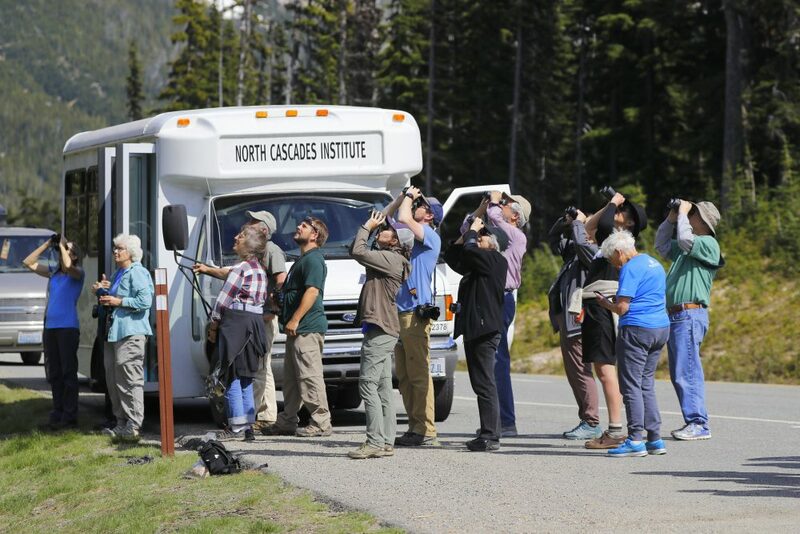 On Saturday morning, in an attempt to see each of the corvid species present in the North Cascades, Marzluff and Swift gathered all of us into two vans, and we headed off for the day-long field trip. Our first stop was by the nearby ferry terminal. This first stop was all about Elvis, the Environmental Learning Center’s resident raven. Known for stealing Mountain Schooler’s sack lunches and scavenging through any participant luggage left unattended, Elvis is a lively member of the Institute’s community. Elvis was first caught in June of 2007 by Marzluff during a similar program, but he has avoided other attempts at capture during all successive years that Marzluff’s seminar has been held at the Institute. Armed with bait the Institute kitchen had been collecting all week (French toast, pancakes, and old loaves of bread), the group was able to attract gray jays, Stellars jays, and Clark’s nutcrackers within minutes. Marzluff almost had birds eating out of his hand, as he attempted to latch onto their feet so that the group might get a closer look at them. We departed from there, and proceeded onto the North Cascades Scenic Highway. 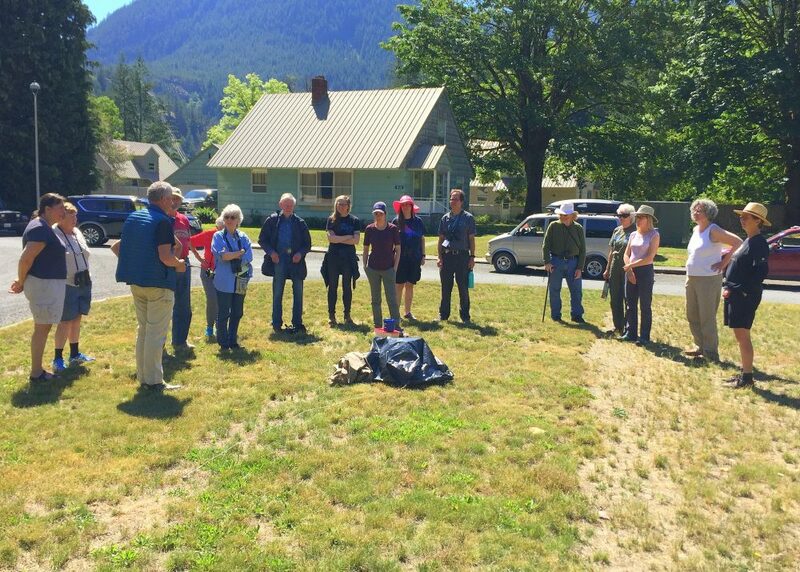 Stops along the way included the Rainy Pass Picnic Area, the Methow Valley, the historic town of Mazama, and the still snow-covered Washington Pass Overlook; all part of the Cascade Loop! The Methow Valley is a 60-mile long glacial valley, just east of the North Cascades and west of the Columbia River, and it contains some of the most diverse and productive habitat of the entire Columbia Basin. It is home to hundreds of wildlife species, including over 40 Washington Department of Fish and Wildlife priority habitats and species, 11 of which are state or federally listed as threatened or endangered. 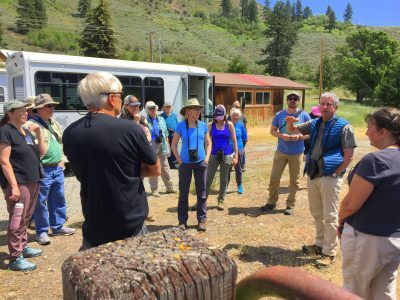 The Methow Watershed is the only basin in the state (and one of the few in the country) that is over one million acres in size and is still home to relatively unfragmented connections between low elevation riparian and shrub-steppe communities into montane and alpine zones. 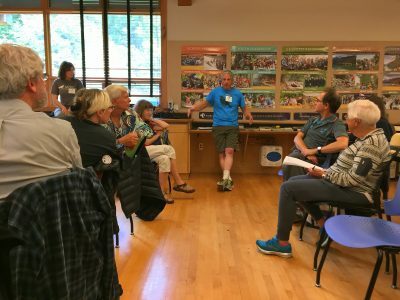 We returned to the Learning Center in time for dinner and a few informational movies afterwards of the life of Corvids, including a film on the exceptional skills exhibited by crows that also highlighted facial recognition studies done at the University of Washington by Marzluff himself. After early breakfast on Sunday morning, we all packed a sack lunch, and headed off to the first stop nearby. The tone of Sunday morning changed with the arrival of a raven, hovering overhead at first, chasing nutcrackers with scavenged pancakes next, and then finally descending onto our growing pile of breakfast-bait. With her interest peaked, Marzluff and Kaeli decided to set up the net-gun, a trap that uses the back-end of a rifle to remotely cast a net on the individual to be captured, and wait to see if the raven took the bait. While participants learned more about the adaptations of the Clark’s nutcracker and watched jays swoop down to within inches of their faces, Kaeli waited patiently to discharge the net, but with no luck. The morning finished with a discussion of proper bird capturing practices, and the ethics of interacting with birds during the scientific process. 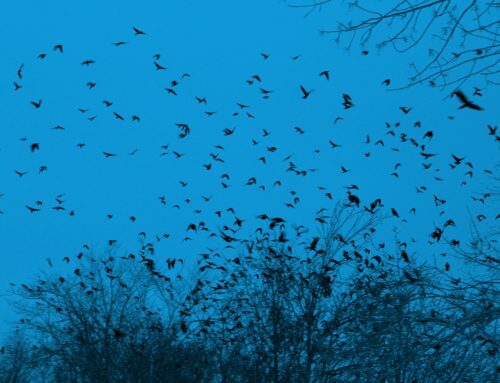 Marzluff noted that our baiting of the birds was not a practice that should be used outside of work studying corvids, and that conditioning of corvid species to human food sources should not be condoned – Elvis being the perfect example of a bird overly reliant on our community for food. 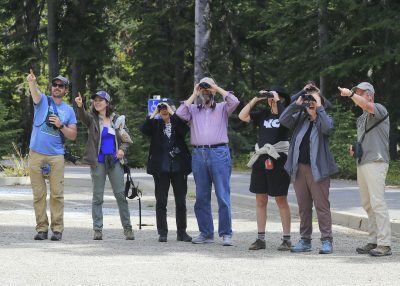 At the same time, participants and Institute staff agreed that the chance to see both ravens up close and to watch field science in action was an exceptional experience. 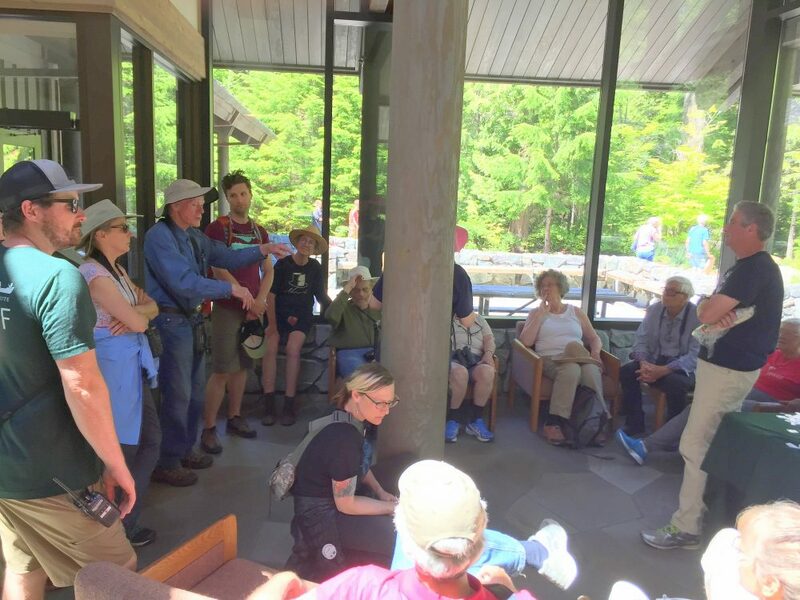 The group visited the North Cascades National Park Visitor’s Center in Newhalem on their way out of town, where Marzluff told stories of yet another raven and his mate – Hitchcock is his name this time – and his uncanny ability to steal windshield wipers from visitor’s cars. 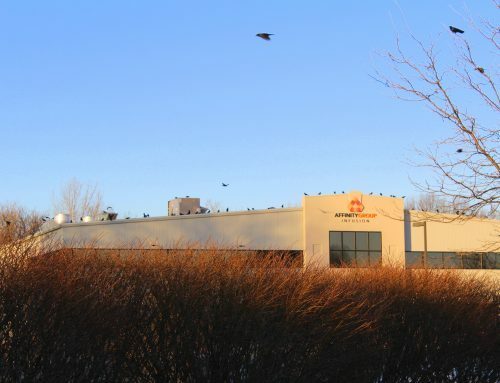 We hypothesized as to why ravens might be interested in car parts, and in the process continued to marvel at the complex and interesting behaviors of the birds that had brought us all together for the weekend. 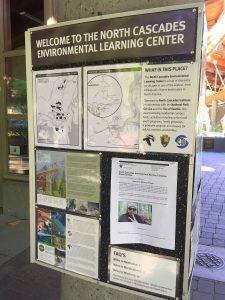 John Marzluff, PhD, is a Professor in the School of Environmental and Forest Sciences within the College of the Environment at the University of Washington. His research on corvids and birds of prey has benefited birds all over the world, from pinyon jays in Arizona, ravens in Greenland and golden eagles and prairie falcons in Idaho to Washington State’s goshawks and the endangered Hawaiian hawk, one of the rarest birds in the world. 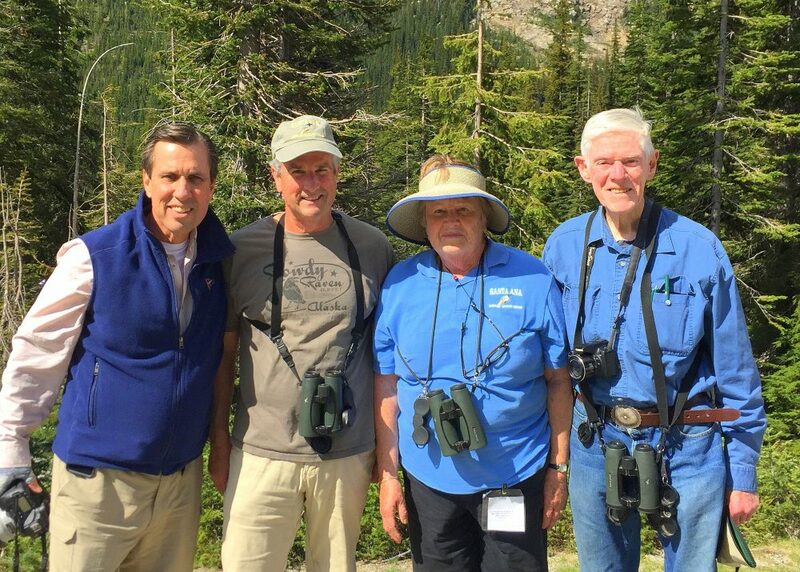 He has conducted long-term studies of urbanization on songbirds in the Seattle area; responses of nest predators and songbirds to settlements, recreation and forest fragmentation on the Olympic Peninsula; and endangered species conservation. 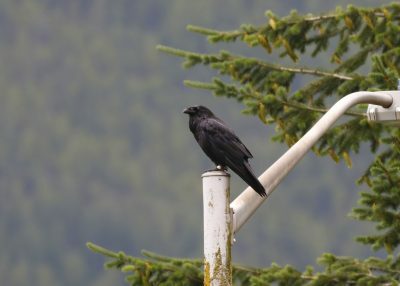 He is the author of several books including, In the Company of Crows and Ravens; Gifts of the Crow: How Perception, Emotion, and Thought Allow Smart Birds to Behave Like Humans; and most recently Welcome to Subirdia: Sharing Our Neighborhoods with Wrens, Robins, Woodpeckers, and Other Wildlife. When he’s not looking skyward, Dr. Marzluff enjoys fishing and dog-sledding.